There was a time when the Washington-Baltimore area was a hotbed – perhaps THE hotbed – for Bluegrass music. Some of the biggest names in Bluegrass hailed from this area, and certainly anyone who was anyone played here. The region was alive with the sounds of mandolins, banjos, fiddles, guitars and even the stray Dobro. Quality venues that offered Bluegrass as their staple abounded: The Red Fox Inn, The Cub Hill Inn, Tiffany Tavern, listening to the Seldom Scene at The Birchmere every Thursday night, and on and on. Fans of the music kept up with the performers via the Bluegrass Bulletin Board on WAMU’s three hour afternoon drive-time Bluegrass broadcast. One such venue that was always sure to be included on the Bulletin Board was The Friendly Inn in West Friendship, Maryland. With live Bluegrass every Friday and Saturday night, a Bluegrass jam on Sundays, and open-mic nights during the week; something good was always on tap. The crowds were diverse and enthusiastic, one could never be sure who might walk through the door unannounced, and sit in with the performing band. The atmosphere was “vintage”, the performances were uniformly excellent, and sometimes, as is the case with high quality music performed live in an intimate setting, magic happened. History proved that The Friendly Inn was aptly named, it was a place where friends met friends, and people became friends. Such was the case with six couples who, for more than ten years, were “Friday night regulars”, and occupied a location in the main room that became known to the performers as “The Table”. When The Friendly Inn ultimately closed its doors and joined the growing ranks of Bluegrass venues that are now just a part of history, the “regulars” looked for a suitable replacement for their Friday night musical forays. It quickly became apparent that such a replacement did not exist, and an idea was born. A pot luck dinner was organized, and the twelve “regulars” met to discuss what they might be able to do in order to offer a new venue for Bluegrass. Since everyone had day jobs, the idea of buying and re-opening the now-defunct Friendly Inn, or establishing some other commercial venture, could not be part of the discussion. This was not to be a money-making enterprise, so it was decided that a series of concerts supported by voluntary donations from the attendees would be a viable approach, and could serve as mini-reunions for the bands and customers who had frequented the Friendly Inn. Now, the next issue had to be considered: where could such a concert series take place? As luck would have it, one of the “regulars”, Rob Miller, who along with his lovely wife Laura, had for more than twenty years hosted his famous Barn Party every October on his farm in Westminster, Maryland. 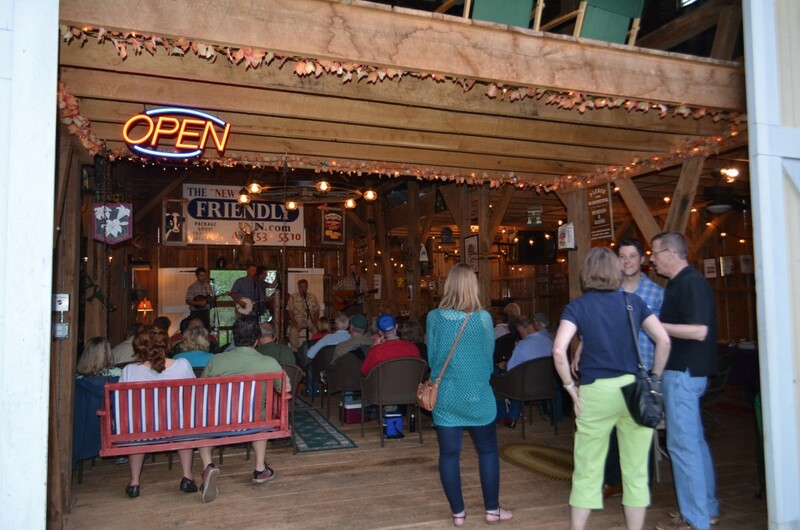 Bluegrassers from far and wide attended, and just like The Friendly Inn, you could never be sure who would show up to dazzle with Bluegrass brilliance. Rob’s property comes complete with a beautifully renovated dairy barn originally constructed in the 1800’s, which he offered as a venue for the concerts. The idea for Rob’s Bluegrass Barn had come to fruition. The concerts are warm weather events, beginning in May and continuing through the summer months until late September or early October. As of 2014, we are offering six concerts each summer, with a published schedule that announces the bands and performance dates in advance of the beginning of our season. As previously mentioned, this is not a business venture, the series is supported by your voluntary donations at the door. We announce a suggested amount, but attendees are free to donate any amount they choose. After we cover the expenses for items provided at the event, and set a small amount aside for a “rainy day fund”, virtually all money collected goes to the bands. Our goal is to provide a quality location where fans of Bluegrass can hear a good, live performance. To keep the spirit of fellowship alive that had been so much a part of The Friendly Inn, we decided a great way to begin each event would be with a pot-luck dinner. Participation in the pot-luck is not a requirement of attendance, but many folks do bring something to share, that part of the evening has proved quite successful. The various dishes are placed on long tables as they arrive, and remain for the duration of the evening. Attendees avail themselves of the menu prior to the start of the concert and also during intermission. The main event of the evening is of course the musical performance, and we strive to offer the best music available to go along with the outstanding venue. We have booked well-known performers from the Maryland-Virginia-Pennsylvania area such as Dee Gunter, Harold Tipton, The Satyr Hill Band, Blue Train, John O’Dell, Fastest Grass Alive and many others. Our stage has also hosted more widely-known performers such as Dobro legend Mike Auldridge, who gave one of his final performances here; Darren Beachley, former lead singer for Doyle Lawson & Quicksilver as well as Legends of the Potomac; Allen Mills’ Lost and Found; and barn favorite local legend Mike Munford -2013 IBMA Banjo Player of the Year. We will also schedule national level bands as they become available in our area, and have already begun to do so. That is a brief look at who we are, what we are endeavoring to do, and why we are doing it. We believe that great music offered in a unique and outstanding venue, with a friendly, knowledgeable and appreciative audience all combine for a memorable evening. If there is any proof of that needed, it can be seen in our experience that many folks who have come to our concerts are now “regulars” in their own right, and every band that has played in the Barn is eager to return. When high quality music is performed live in an intimate setting, magic can happen. Magic has already happened at Rob’s Bluegrass Barn, and it will happen again. Check our schedule, we invite you to join us and experience it for yourself.